Perhaps the most important out of all sports mom tips is advice on how to store all that equipment. I mean, it spills out everywhere, right? 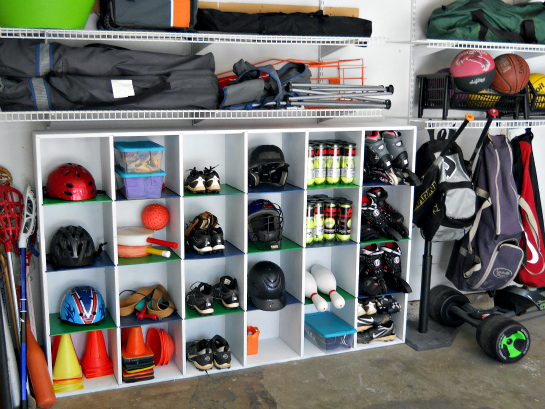 You trip over cleats in the mudroom, some gloves are in the garage while others are in the kids’ rooms… so unorganized. 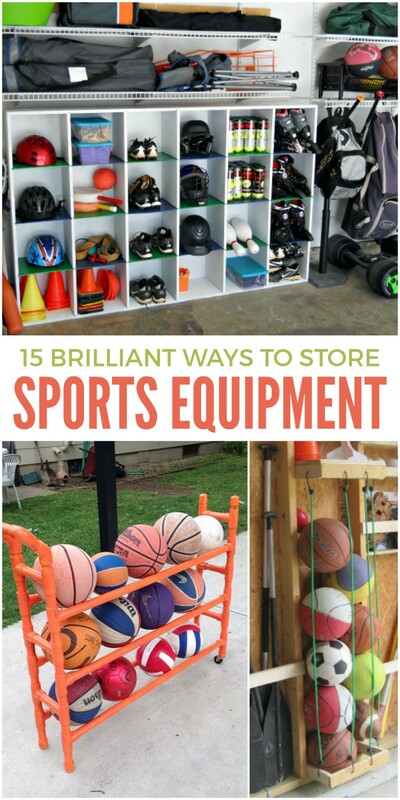 But with these sports equipment storage ideas, you’ll know just where everything is so you can focus on other things… like winning as a sports mom and trying to be on time for all those practices and games! If you keep your kids’ sports equipment in a closet, a large laundry basket is a great way to wrangle all those balls and racquets. 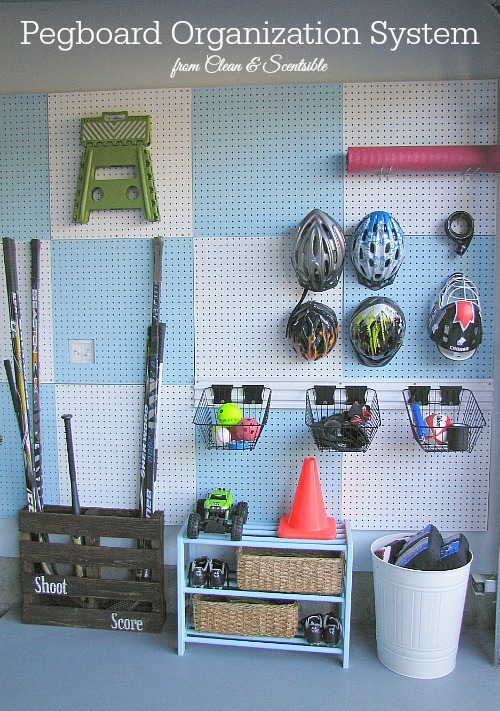 For garage storage, a peg board is a genius idea! Add hooks for helmets, baskets for smaller balls, and a pallet bat stand for those baseball bats. Here’s another example of pegboard storage in the garage, but the balls are stored in a mesh laundry bag. 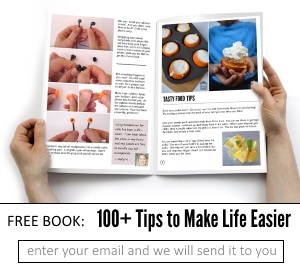 Not a bad idea! 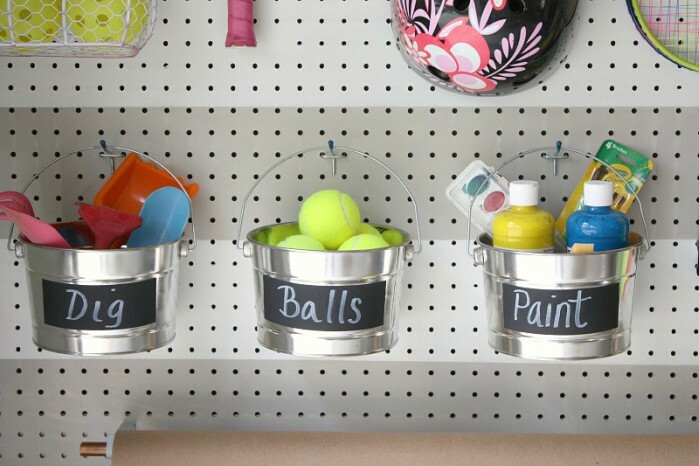 Attach pails to the pegboard to hold small balls like tennis balls and baseballs. 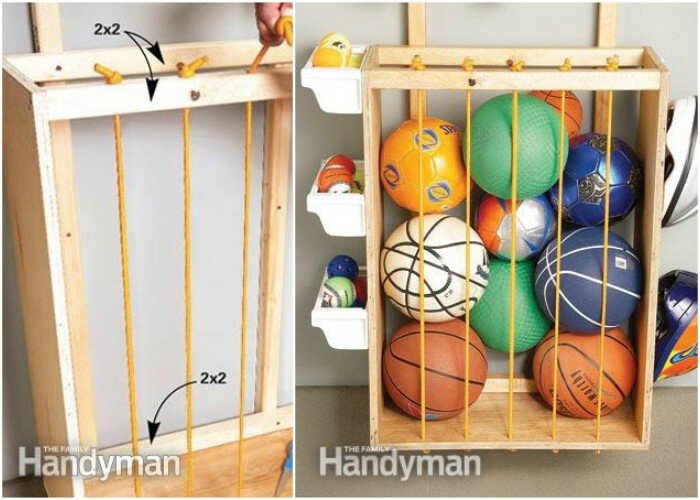 Make use of some studs to create a flexible storage area for sports balls. Add a u-shape to connect the studs together at the top and bottom, drill some holes, and then string 3-foot bungee cords to keep everything inside. Here’s another example of the ball corral with gutter troughs attached to the side for small ball and mitt storage. 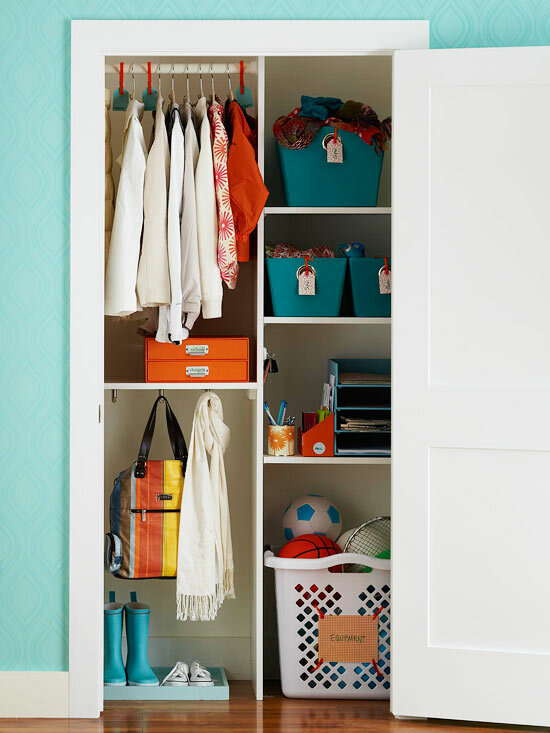 Repurpose an old bookshelf or build your own garage cubbies. 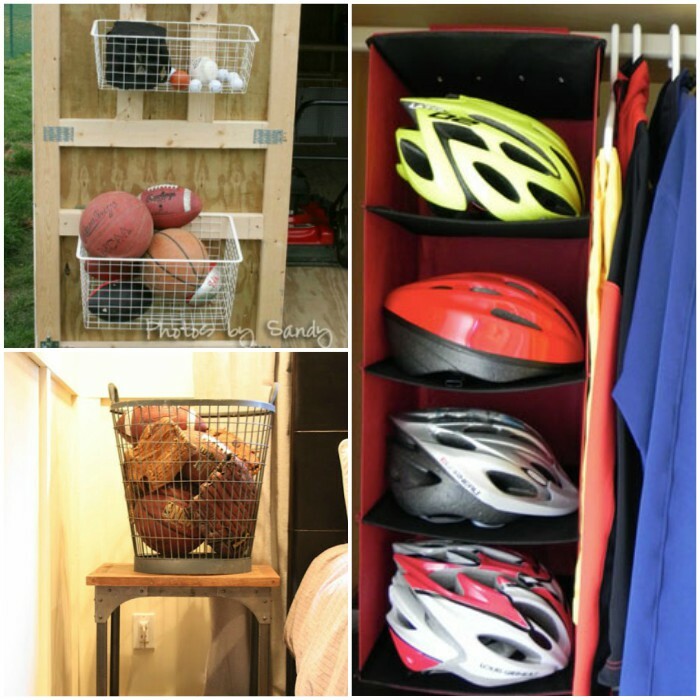 Love that it provides storage for shoes, helmets and other smaller pieces of equipment. 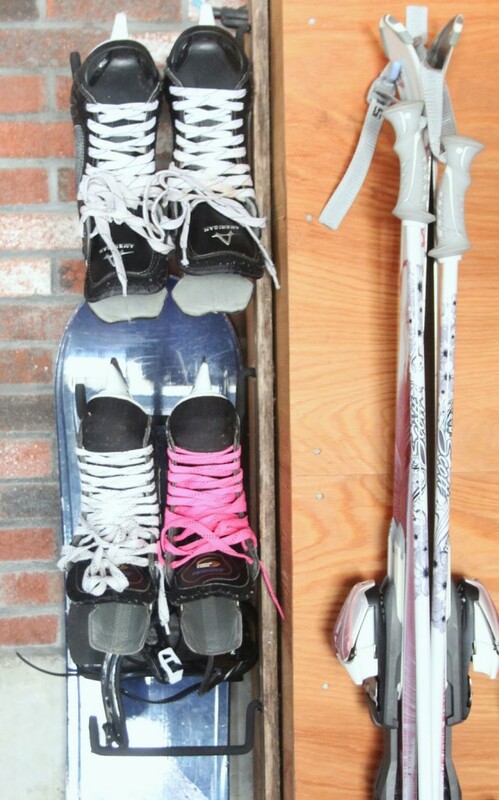 Use rubber coated hooks and ladder hooks to hang ski poles and ice skates when they’re not in use. 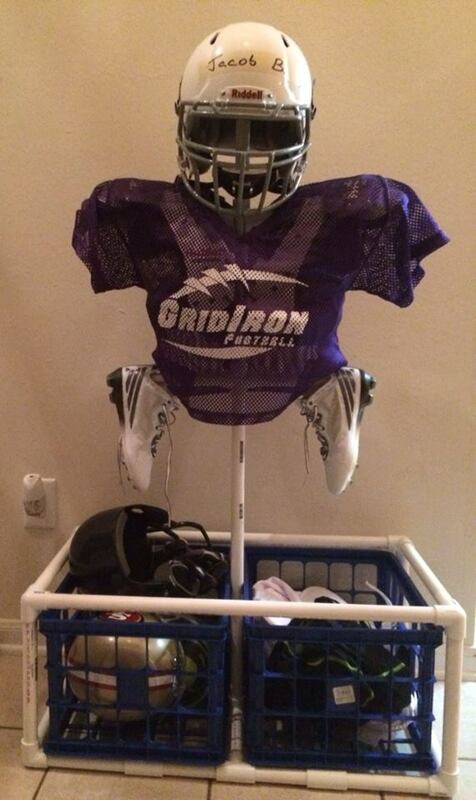 For a cheap solution, try this PVC football equipment storage idea. (Unsure of original source – If it’s yours, let us know so we can credit you! 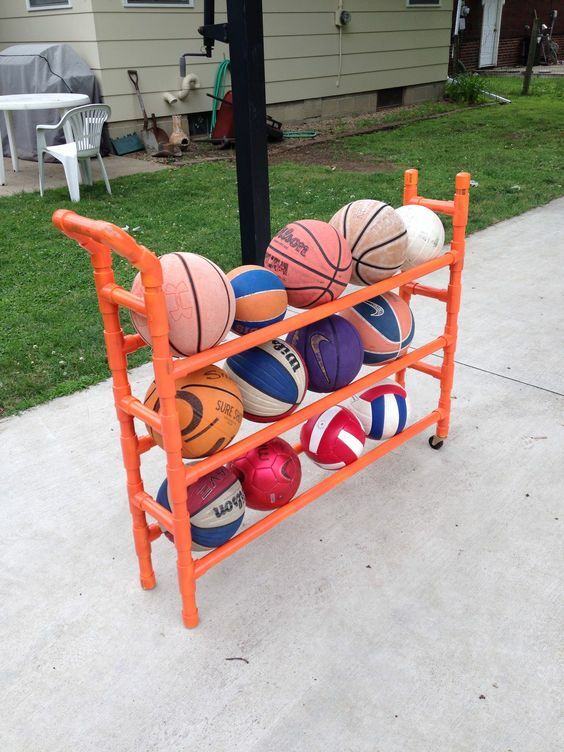 A PVC ball rack is another affordable project you’ll want to tackle to corral all those balls. A sweater hanger makes for great helmet storage, don’t you think? 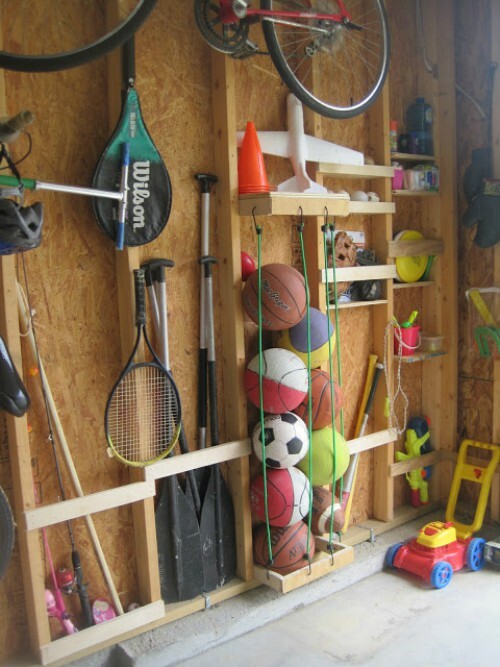 Attach baskets to the back of the shed door for balls and gloves. What a great idea for those who don’t have a garage! Want the kids to confine their equipment to their bedrooms? A wire basket holds a lot, and it provides some decor for the room, too. 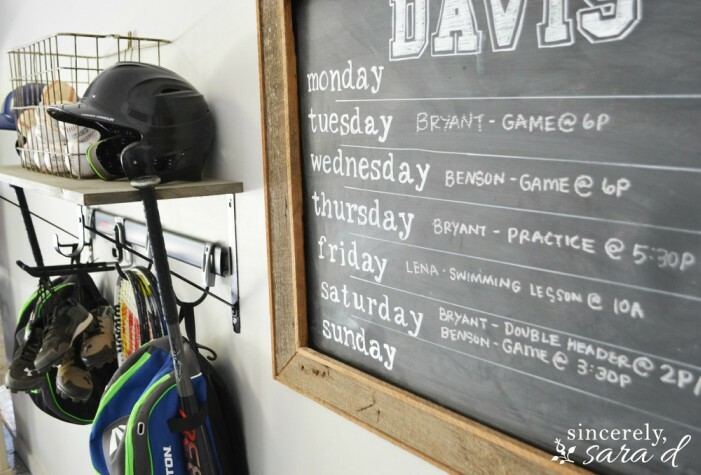 And a bonus tip for keeping parents organized: Put a chalkboard schedule near your sports equipment storage area to keep track of the kids’ games and practices.